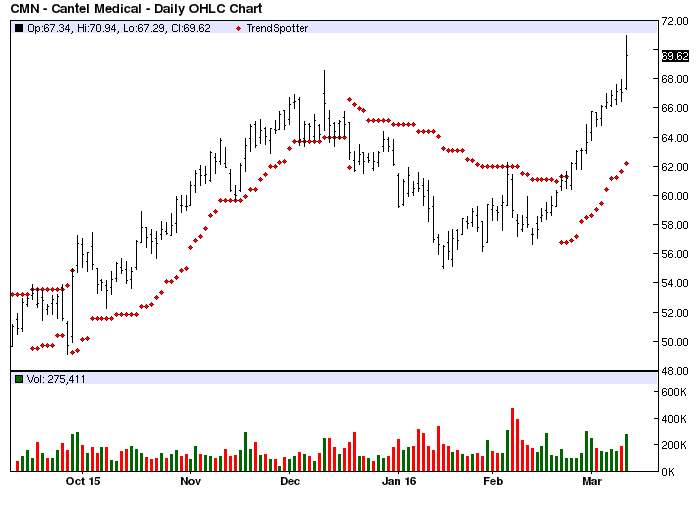 The Chart of the Day belongs to Cantel Medical (CMN). I found the medical infection prevention stock by using Barchart to sort today's All Time High list first for the highest number of new highs in the last month, then again for technical buy signals of 80% or more. Next I used the Flipchart feature to review the charts. Cantel Medical Corp. is a healthcare company concentrating primarily in infection prevention and control products and diagnostic and therapeutic medical equipment. Through its United States subsidiary, MediVators, Inc., Cantel serves customers worldwide by designing, developing, manufacturing, marketing and distributing innovative products for the infection prevention and control industry.